This 5-day, competency based, workshop is AIB’s most comprehensive program. Learn the full spectrum of care of vestibular diagnostic and treatment management of the dizzy patient. Includes assessment, diagnostic testing, rehabilitation techniques and treatment. VNG/ENG, postural stability, active head rotation tests and more. All techniques for the evaluation and treatment of BPPV, and vestibular rehabilitation therapy using diagnostic based strategies for all types of vestibular and balance disorders. 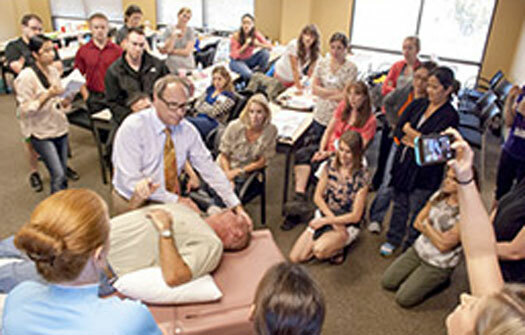 Physical Therapists – This program has been submitted to the Florida Physical Therapy Association for 32.5 CEUs. The program is approved by the American Academy of Audiology to offer 3.25 CEUs. This educational offering qualifies for 32.5 continuing education hours as required by many national, state and local licensing boards and professional organizations. Save your course outline and certificate of completion, and contact your own board or organization for specific filing requirements. To certify with AIB, you must possess an earned degree in audiology, medicine, physical or occupational therapy from an accredited university. Assistants may attend, however, certification is reserved for individuals with an earned degree in the specialties listed above. At the conclusion of the workshop, you will be given a take an online examination. The manual portion of the CRM practice that will be performed during the workshop while at AIB. **The American Institute of Balance proudly offers CEUs to both Physical Therapy Assistants (PTA) and Certified Occupational Therapy Assistants (COTA) for the completion of workshops. Currently, certification is only offered to Physical Therapists, Occupational Therapists, Audiologists and Physicians secondary to state and practice guidelines. Apply vestibular anatomy and physiology to the diagnosis of vestibular disorders. Administer reliable and valid vestibular assessment tests. Accurately interpret and report results using Clinical Pathways. Utilize results for appropriate triage of patients for Vestibular Rehabilitation Therapy or applicable management strategies. Differentiate vestibular test abnormalities that identify patients who are appropriate candidates for therapy. Initiate and implement a comprehensive vestibular rehabilitation program within the scope of their practice. Best comprehensive course instruction with greatest clarity on the subject that I have experienced to date. Great. Terrific insight. Highly recommend to all MD's / Fellows. After doing VNGs FOR a year, this course was [priceless] IN helping me understand the bigger picture. I really appreciated Dr.Gans' sense of humor.